I am re-posting my blog post from November 28, in honor of the movie Lincoln and the Academy Awards. Recently I got to see the new movie ‘Lincoln.’ The movie is directed by Steven Spielberg and its music composer is John Williams. Without a doubt, it was one of the best movies I’ve seen in a while. I highly recommend it, both for people who are interested in history and also for people who just want to watch a stimulating two-and-a-half hour movie. The heart of the movie is the story of the passing of the thirteenth amendment. The movie does a good job of portraying just how deeply racism was entrenched in the American psyche at the time – even among the citizens who sided with the North during the Civil War. Several things about the movie struck me as especially well done. First, Daniel Day-Lewis is an outstanding Lincoln. Human and approachable, his Lincoln is just as good at commanding the attention of a room full of powerful men as he is at telling witty stories in the company of friends and acquaintances. I am not a Lincoln scholar, but the Lincoln I saw in the movie synchs with everything I know about the man – folksy, a backwoods type, charming, and a man with deep moral convictions. Day-Lewis is very deserving of the Best Actor award for this performance. Second, Tommy Lee Jones deserves a Supporting Actor nod for his portrayal of the Pennsylvania firebrand Thaddeus Stevens. I didn’t really know anything about the historical Stevens before I saw the movie. But I was highly impressed with the acting job that Jones pulls off in the movie. Jones’s interpretation of Stevens is a believable portrayal of a man whose political wheeling and dealing was essential to the post-war reconstruction effort. You can almost see the wheels turning in his head as he plots his political schemes in several different key scenes. I liked also the movie’s portrayal of Mary Todd Lincoln. She is often portrayed as a historical villain of sorts, so it sometimes is hard to get inside her head and to see life from her perspective. The movie offers us a very sympathetic portrayal of how deeply touched she was by the death of her son Willy. After his death she was pretty much a broken woman. I really have very few complaints about the movie. Its screenplay is outstanding – perhaps, in fact, its strongest part. One thing that I do think was insufficiently emphasized in the movie is the general amount of Christian and religious sentiment that was pervasive among Lincoln and the other political leaders of the time. Perhaps it is not politically correct these days to portray such religious sentiment with as much robustness as was actually the case at the time. The objectionable parts of the movie are its language (the F-bomb is dropped several times) and also its graphic portrayal of human death and human body parts in some battle scenes. John Williams’s musical score is not as sweeping as some of his scores for past Spielberg movies (E.T., Jaws, Indiana Jones), but it is a brilliant and intentionally understated musical background that lets other aspects of the movie take center stage. On the whole, the movie appears to me to be an accurate depiction of one of the most important three-month periods in the history of the United States. For that, Spielberg, Day-Lewis, Jones, Williams, and the rest of the cast are deserving of our thanks. 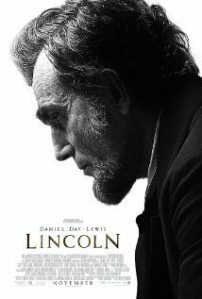 Sadly, you’re right about this…”to portray such religious sentiment with as much robustness as was actually the case at the time.” I have yet to see Lincoln, but will give it a look when it comes to the Video Club over here in Portugal or on iTunes. Thanks for the review and for the warning about the objectionable content….another sad commentary about our modern culture.